If you are shopping for a chandelier to hang in your home or office, M&M Lighting in Houston, Texas has your lighting needs covered. 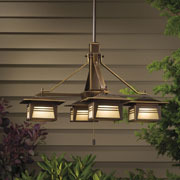 Whether your goal is to create an elegant, dramatic focal point in your formal dining room with a crystal chandelier, you want to add an outdoor chandelier to your new outdoor living space, or you need information on chandelier lifts and dimmers, our trained lighting experts would love to speak with you about your design, style and budget preferences. 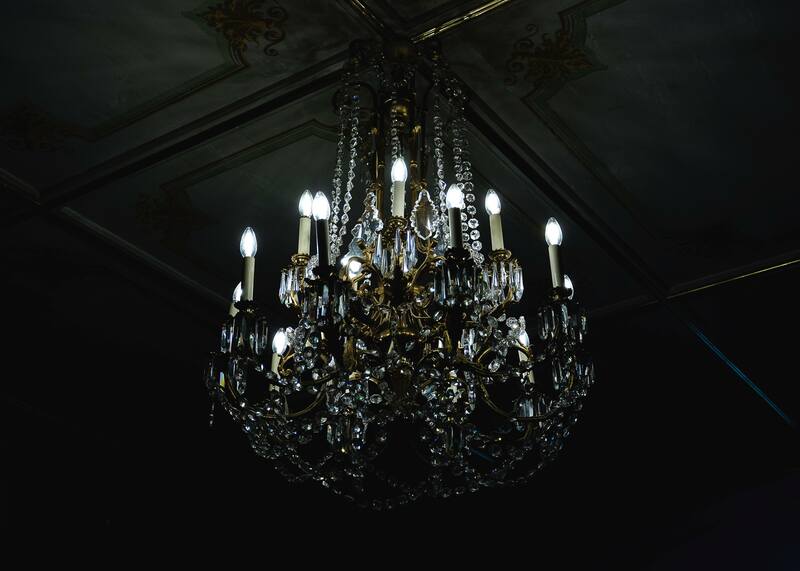 Browse our wide inventory of lighting solutions in our online catalog now, or stop by our Top Rated Local® lighting showroom to discover the various styles of chandeliers available to you! When it comes to finding the right size of a chandelier you want to place in your home or office, you want to ensure it’s the perfect fit for the room. A chandelier that’s either too large or too small for the room will make the overall design of the room feel wonky, oversized or congested. First, you need to determine which room you are going to hang your chandelier, and from there, you can follow this basic list of rules to find the right sizing of a chandelier for that room. 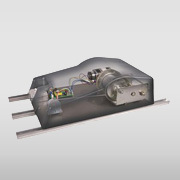 Measure the room’s length and width. 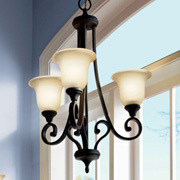 From there, you can determine how long the chandelier lighting fixture you choose needs to be. For a general rule of thumb, the design should have about four feet or more of distance from the walls of the room. Another trick is to add up the room’s length and width measurements, which will give you a recommended overall diameter measurement in inches. 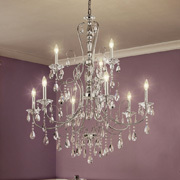 Example: If you have a 10-foot by 10-foot room, your chandelier should be about 20 inches in diameter. Measure the room’s height from floor to ceiling. If the chandelier will be hanging freely in an entryway, hallway, foyer or room of the like, you want to measure the space between your ceiling and flooring. For every foot in that space, you want to plan for about 2.5 inches to 3 inches of chandelier height, and then multiply those two numbers together. 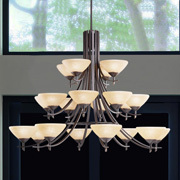 Example: If you have an 8-foot tall ceiling, you want about a 24-inch long chandelier fixture. Measure the space between any table surfaces to the ceiling. If you are hanging your chandelier in a room that will have some type of table surface, such as a dining room or kitchen area, you want to ensure there is enough space between the surface and the chandelier. We recommend chandeliers hang between 30 and 35 inches above your table if your ceiling is less than 8-feet tall, and if your ceiling is taller than 8 feet, your chandeliers should hang about 36 to 40 inches above the table. 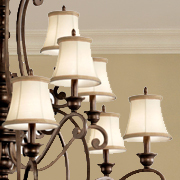 Your chandelier should also be about 1 foot narrower than the surface of your table. How Big Is The Largest Chandelier? But don’t worry — you can’t still hang a beautiful chandelier in your home that doesn’t need to compare to the “Reflective Flow.” Continue reading for tips on where you can hang your chandelier! In an open pathway (i.e. foyer, hallway, entryway). You should leave at least 7 feet of space between the chandelier and your floor. Above a table. Leave about 30 to 40 inches above the surface, depending on the height of your ceiling. In a bathroom. You can hang a chandelier over your bathtub for an elegant and relaxing addition to your bathroom. Hang it about 8 feet over your tub for sufficient clearance room. You can also hang smaller chandeliers above your sink/vanity area. 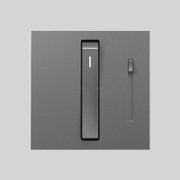 In large rooms (i.e. bedrooms, living rooms, etc.). Use our sizing guidelines above to find the perfect size chandelier for these rooms. Outdoors. Who knew you could place chandeliers outside? We have chandeliers that are specifically designed to withhold outdoor climates so you add a sense of sophistication to your outdoor spaces and patios. At M&M Lighting, we offer a large variety of chandelier lighting brands for our customers — both online and in our Houston showroom. Some of the high-quality brands we carry include Kichler, Visual Comfort, Worldwide Lighting, Progress Lighting and more. Whether you’re looking for an embellished piece for above the staircase in your foyer or you’re looking to add a simple-yet-elegant crystal piece to your dining room, we can connect you with your perfect chandelier. Our lighting experts are educated and knowledgeable about recent lighting trends, so they can help you find something that will fit your style and budget. Schedule an appointment with us today. 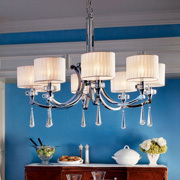 For more information on chandelier lighting trends and advice, check out our blog. 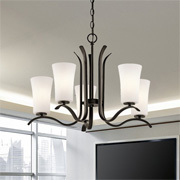 Some of our chandeliers blog posts include “Chandeliers For Rooms Other Than Your Kitchen and Dining Rooms”, “Three Main Types of Chandeliers”, and “A Lineup Of Our Favorite Chandeliers”.